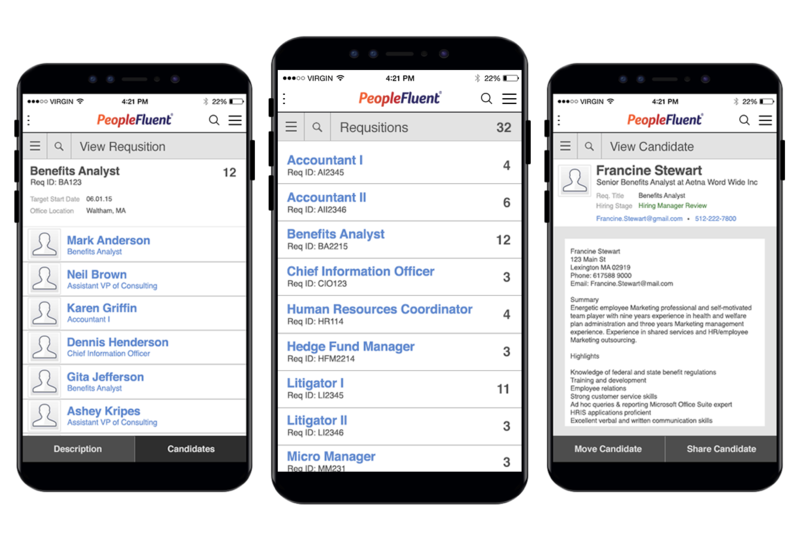 Peoplefluent's recruiting management software (RMS) is designed to aid in the recruiter's admin tasks such as requisition creation and management from the initial posting to the completed hire. 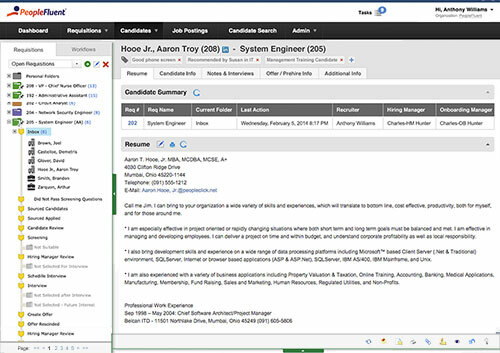 Peoplefluent wanted to take this complex RMS software and craft a limited mobile experience for the most desirable tasks that a recruiter might want to have access to while they were away from their computer. To comply with Peoplefluent’s privacy agreement, I have omitted and/or obfuscated confidential information in this case study. Fictional companies and information has been used in these designes. All information contained herein is my own and does not necessarily reflect the views of Peoplefluent or its partners. 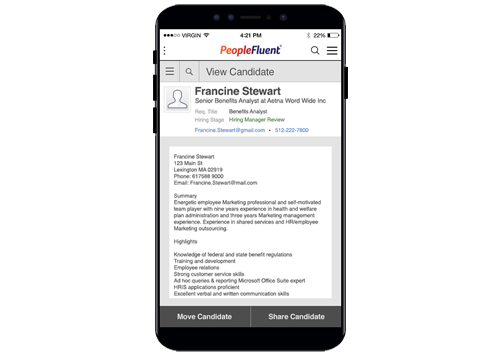 During the ongoing effort to make all of Peoplefluent’s software more responsive a mobile focused, it was determined that a solution for Peoplefluent’s recruiting management software could be developed that focused more on the core needs of the mobile user. The base RMS software was too complex and feature rich when brought to the mobile level so we needed to boil it down to the essentials - i.e. maximize efficiency and minimize frustration. We needed to define a desirable functionality target that met the needs of the user. I helped lead the effort with another senior designer on our UX team to produce this mobile solution and work towards developing wireframes and interactive prototypes. We worked with product managers and the engineering team during all phases of development knowing that a collaborative culture would help inform our design. We opted for a lean approach towards our design mockups which emphasized rapid sketching & prototyping. Opportunities for input during our regular design meetings created a collaborative environment through all phases of the project. Meeting with key stakeholders helped us to understand the perceived challenges and desires. We crafted an experience strategy that matched our expectations and constructed a shared vision outlining the product framework. While defining the emerging requirement definitions for the product I was inspired by an article I had read on medium.com by Wouter de Bres - https://medium.com/@WdeB/hierarchy-of-ux-needs-b1abacc35a80. In this article Wouter discussed how he looked at psychologist Abraham Harold Maslow’s view that all behavior is motivated by a need hierarchy of needs. By looking at this through a UX lens, he postulated that the base need of a UX hierarchy is Purpose. What are the user’s needs and motivations? How can we define their desires? 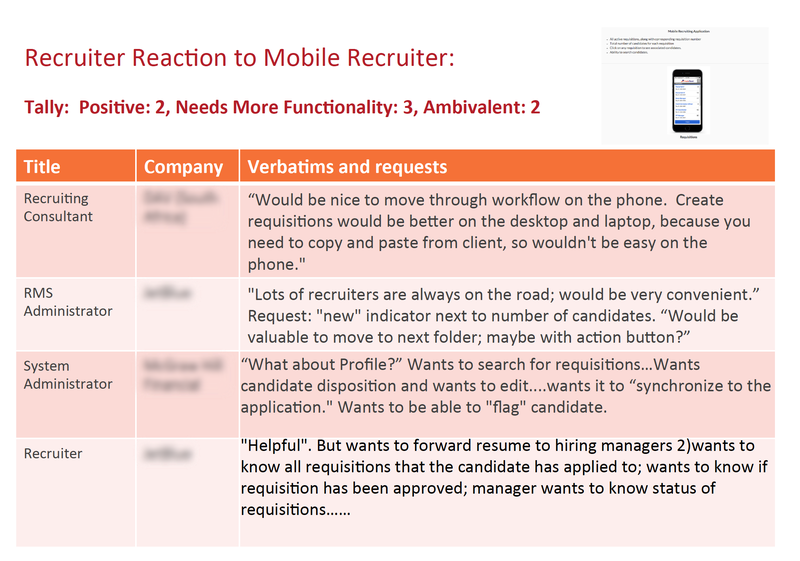 What were the main functions a recruiter or hiring manager desire? Personas could only get us so far along this path and I was concerned about how differing user needs could muddy the waters and create feature bloat. Since the timeline for moving this product to market did not allow for individual customization in the design, we needed to determine a ranking scale for feature functionality to help us define our direction. Based on usage analytics, we determined a list of the most commonly executed actions in the software. We gathered this information into a survey which we shared with selected clients and internal users. 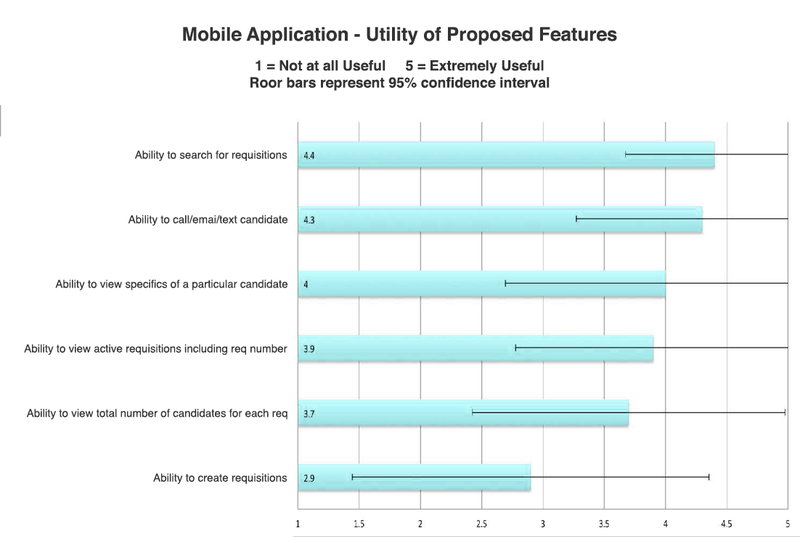 Through these customer surveys as well as some brief post survey interviews and user study, we were able to define what would be most useful and practical for a typical recruiter. 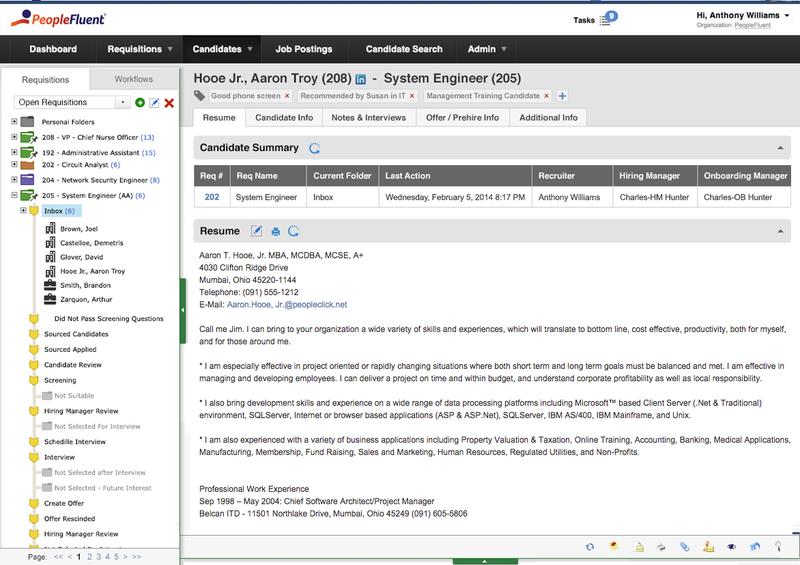 Tasks such as candidate review, status updates, candidate advancement and email functionality were all prioritized. Once we had our key functions in hand, a series of wireframes and simple clickable prototypes were created featuring these functions. Using these prototypes, recruiters were given specific as well as open ended tasks to complete and were asked to determine the overall ease of use and usefulness of the experience. While these prototype reviews were unfortunately very limited in scope, it did help us refine our designs. As an ongoing effort I’ve continued to design small, vision focused widgets for RMS, as well as other Peoplefluent products, for use on Peoplefluent’s shared dashboard. Taking some of the data collected for the planned RMS mobile solution, I created mockups for some interactive informational graphics and designs. It is my hope that future mobile efforts will allow for development and implementation of these ideas.